Monty Suites is a magnificent structure located at the hub of local and international businesses in Calabar at Northern Industrial Layout, Murtala Mohammed Highway, Esuk Utan. It is close to Calabar Harbour. Monty Suites is a good choice for family vacations, business trips, meetings/conference and event reception. It has 120 luxury suites divided into these categories: Bachelors Room, Standard Room, Executive Room and Junior Suite. 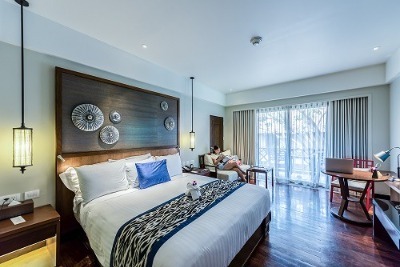 Each room is fitted with a sit-out balcony, telephones with intercom features, air conditioning, complimentary toiletries, plasma screen cable connected TVs, work tables with chairs, and spacious wardrobes. All guests have access to free Wi-Fi. Monty Suites has a 1500 seater banquet hall, and a 60 seater boardroom. It also has a swimming pool, a fully equipped gym, and a gift shop. Guests can enjoy meals and drinks at the onsite restaurant and bar, or confectioneries at the Pastry/Coffee shop. Outdoor dining by the pool is available. Along with an around-the-clock front desk, doormen and room services, car hire and laundry services are also available. Guests may also make use of the bus shuttle services for guided tours of Calabar. Onsite parking is available and the premises are guarded by security personnel. Q: Does Monty Suites offer free Wi-Fi? Q: Does Monty Suites have a restaurant? Q: Does Monty Suites have onsite parking? Is it free? A: Yes, self-parking is free. Q: Does Monty Suites accept cash, cheques, cards, and bank transfers? Q: Does Monty Suites allow pets? Monty Suites is a budget hotel in Calabar, Cross River. The hotel is very close to the Airport. The room was very cozy and had every item I needed to pass the night. Electricity was constant, the management was very nice to me as their guest in the hotel. My experience was a great and memorable. The hotel's charges is moderate but their services is awesome. The staff were professional and friendly. The had tasty dishes too. I'm back to Lagos now but there is now question what hotel I will use whenever I am in Calabar. I enjoyed my stay at Monty Suites. It had a decent environment with lovely scenery. The room was alright and up to standard. I had to go outside to eat because the meal I was given was sandy and the juice was open. The hotel had an impressive service with friendly environment and good security. I had a wonderful experience at this hotel. Have nice pictures of Monty Suites?